I know I promised you a recipe every day this week before thanksgiving but yesterday was extremely hectic; so I apologize for posting this late! And I apologize again because yesterday was Monday and I was going to post a Thanksgiving recipe that came from this month’s cookbook but when I went to make the recipe I realized I was missing a few ingredients. So I will post that cookbook of the month recipe tomorrow (you must check back because that recipe is defiantly a keeper and a must for Thanksgiving). So the blog post below really isn’t your typical carefree ramblings about my life in and out of the kitchen. I have a little side project I am working on (which I will share more about soon)! But here is a glimpse at my writing style for that! So I hope you enjoy learning a little about the sweet potato. Thanksgiving won’t be Thanksgiving without sweet potatoes. However, many sweet potato casserole recipes out there are loaded with fat and sugar and use canned sweet potatoes. Sweet potatoes are very healthy and provide many vitamins and nutrients but when drenched with butter and sugar all nutrition is lost. Why are sweet potatoes so healthy? According to the Center for Science in the Public Interest (CSPI), the sweet potato is the #1 Super Foods for better health, and is the king of all vegetables. 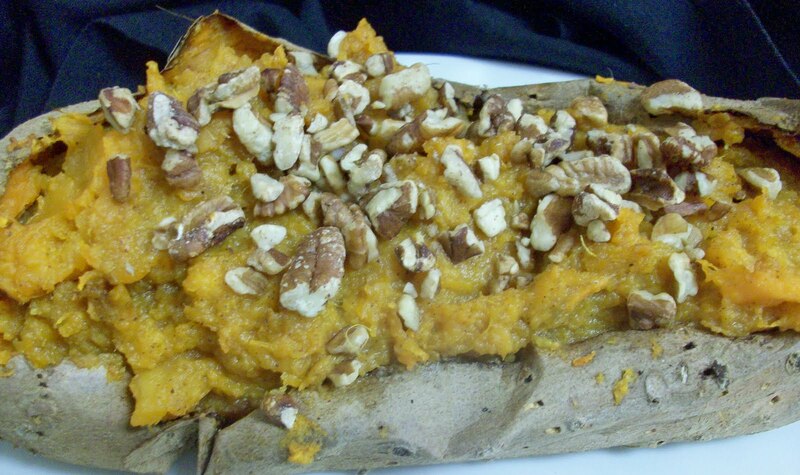 Sweet potatoes are loaded with vitamin A, which is important for vision as well as skin, nail, and hair health. It is also high in potassium, which helps heart and kidney function. Vitamin C is also found in high levels in this vegetable. Vitamin C promotes healing and helps the body fight infection. Sweet potatoes contain calcium as well, which helps build strong bones and teeth. This sweet potato recipe is easy to make, uses fresh sweet potatoes, and is a little bit more healthy that that traditional Thanksgiving Sweet Potato Casserole but still has all the traditional sweet potato flavors. Preheat oven to 375 degrees. 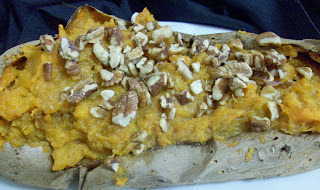 Arrange the sweet potatoes on a baking sheet, and bake in preheated oven for 1 hour. Cut a slit into the top of each potato. Carefully scoop out the pulp from the potato, leaving the skins intact; place the potato in a large bowl. Add the sugar, pumpkin pie spice and the honey butter to the potato and stir together. Stuff the potato mixture back into the reserved potato skins. Sprinkle the pecans over each potato. Return the stuffed potato skins to the oven; bake another 12 minutes. Any extra honey butter can be used on Thanksgiving Day rolls. Whip all together with an electric mixer and serve at room temperature.